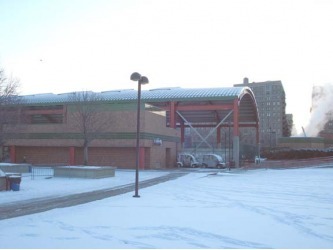 The Riverbank State Park is appropriately considered a one of a kind community complex. Its design was inspired by the Japanese tradition of blending nature and city, modeled after Tokyo’s rooftop gardens. As many urban historians note, the construction of the Henry Hudson Parkway in 1937 created an 11-mile north-south rift between the Hudson River and residents of Manhattan’s Upper West Side. Riverbank State Park offers a unique design solution in restoring river access to the adjacent community, although the position of this amenity, on top of the sewage treatment plant, continues to generate controversy. Perched atop the North River Wastewater Treatment Plant, the Park is a multi-layered creation elevated 69 feet above the Hudson River. This 28-acre space includes five main buildings that house an Olympic-size pool, a skating rink, an 800-seat cultural theater, a 2500-seat athletic complex with fitness room, and a 150-seat restaurant. The outside sports amenities include a 25-yard lap pool, a wading pool, four tennis courts, four basketball fields, a softball field, four hand/paddleball courts, and a 400-meter eight-lane running track with a football/soccer field. The Park was designed by Dattner Architects and Abel Bainnson Butz Landscape Architects. Construction began in 1992 and was opened to the public on May 27, 1993. The Park's popularity grew to immense proportions. In a short time it became one of the most heavily visited parks in New York City. Its several acres of green-style roof boggle the minds of visitors due to its high altitude in contrast to its amazing view of the Hudson River and panoramic views of New Jersey and Lower Manhattan. The park contains many types of vegetation, including thirty-five foot tall trees. The Riverside State Park complex is used for many different kinds of recreational activities, mainly sports and arts. However, many people are drawn to the complex for its unique compilation of services and its location overlooking the Hudson River. Although many of its facilities are primarily for children and teenagers, services are provided to people of all ages. Kids come to the park through one of two entrances that bridge over the West Side Highway and the west side railroad tracks. Entering the park takes one from Riverside Drive on the east side of the bridge, with standard Parks Department details such as hex block pavers and World's Fair benches, to the complex on the other side, detailed in a more modern, functional aesthetic. The bridge at West 145th Street gently curves over the transportation infrastructure below, and when it touches down on the other side straightens out into an axial path, set at a 45-degree angle to the river, and culminating at a plaza overlooking the water 70 feet below. This path also leads one to the major cluster of buildings on the site – the Athletic Building, Cultural Center, and Skating Rink. These three buildings, which are arranged in a "C" shape (similar to a Snyder public school) open to the south. 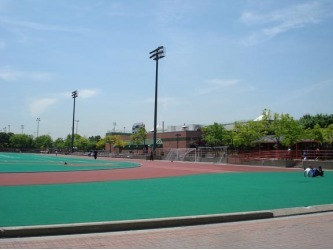 A panel of natural turf occupies the courtyard, which opens out onto the synthetic turf soccer field ringed by an 8-lane running track of red, peletized rubber. The synthetic turf material is bright green and coarse, like a Brillo pad. Newer installations of synthetic turf have longer, more grass-like blades. Given that the park opened in 1993, it probably has one of the first synthetic turf installations in a New York City public park. Three tiers of concrete bleachers ring the soccer field. It is open to the east, separated from the highway below by a narrow strip of community garden plots, and flanked by the Aquatic Center building to the west. The field, with its track is a magnet for youth, especially teenagers. It is one of the only public soccer fields between Central Park and Inwood, and the only one not jointly operated by an adjoining school. 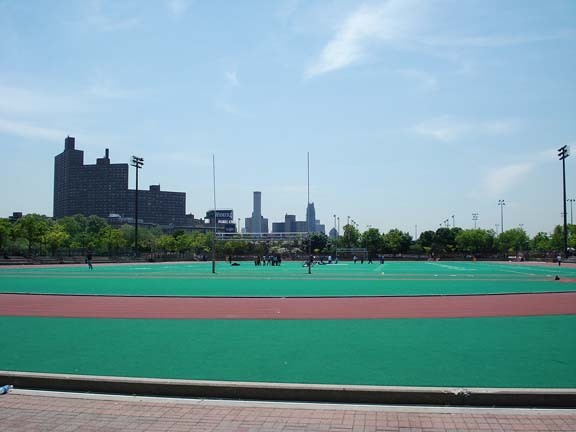 Because of this rarity, the field acts as a draw for teens throughout upper Manhattan and beyond; they use the site both formally and informally. The field is open whenever the park is, an advantage over fields managed by school staff which tend to have more restricted hours. This open, relatively unstructured access is one reason for the field's popularity with teens. The bleachers serve as a place for informal congregation, offering extensive seating and good views of the action on the field and track. Teenagers formally use this part of the park as well via organized football, soccer and track teams. On most days, groups of teenagers can be found exercising, practicing, and hanging out at the field. 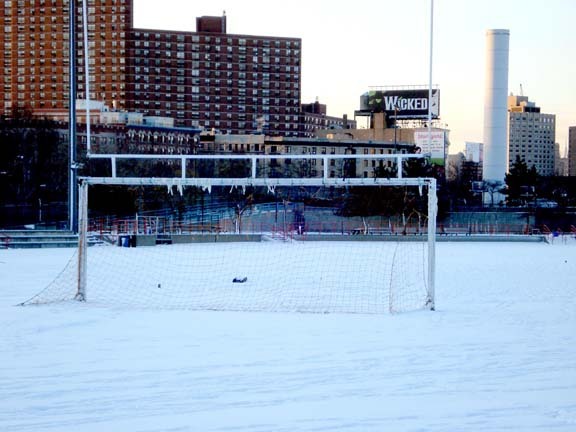 The simple fact that the synthetic turf makes the field usable all year round and even in inclement weather also contributes to the space's magnetism for teens. They don’t have to worry about showing up to the field and not being able to play because park management closed the place to preserve the grass. In this way, the field becomes a place on teenager's mental map of welcoming places they can go pla­­y and hang out.